From manning quarantine lines to flying reconnaissance missions to preparing for an invasion, the U.S. Navy played instrumental roles during the Cuban Missile Crisis 50 years ago. On a tense day in October 1962, the USS Allan M. Sumner(DD-692) was about 500 miles off the northern shore of Cuba, trailing a Soviet freighter. President John F. Kennedy, after learning that the Soviet Union was sending ballistic missiles to the island nation, had proclaimed a quarantine against ships carrying offensive arms there. The Cuban Missile Crisis had moved from the White House and the Kremlin to the sea, and suddenly the crisis was focused on the Sumner . That was the Navy on the quarantine line—ships ready for action and a command system that reached from the Pentagon and President Kennedy to destroyer captains and their crews. Before the crisis ended, the Navy would have more than 140 ships in the Caribbean and over 350 combat aircraft at area airfields. 2 They were responding to a Cold War confrontation that had begun in September 1960 when the Soviet freighter Atkarsk arrived at Nikolaev, the Black Sea port used for exporting weapons and military equipment from the Soviet Union. Strengthening his bond with Cuban Prime Minister Fidel Castro, Soviet Premier Nikita Khrushchev was arming the country 90 miles from American shores less than a year after Castro had led a revolution that toppled the U.S.backed regime of dictator Fulgencio Batista. Eventually the arms transported to Cuba would include nuclear weapons, and the day would come when a wrong move by ships such as the Sumner could launch a nuclear war. Not since the Cold War had begun would so much depend on the ships and men of the U.S. Navy. As the NSA tracked the Atkarsk , President Dwight D. Eisenhower responded to the rapidly strengthening Soviet-Cuban alliance by preparing to proclaim a trade embargo of Cuba, barring all exports except medical items and food. 4 President Eisenhower’s decision came as Cuba was becoming a major issue in the presidential campaign of Vice President Richard M. Nixon and then-Senator Kennedy. On 29 August, photographs taken by a U-2 spy plane revealed eight surface-to-air missile (SAM) sites under construction. When briefed on the U-2 photographs, McCone said: “They’re not putting them in to protect the cane cutters. They’re putting them in to blind our reconnaissance eye.” 9 The first shots of the looming crisis were fired on 30 August, when a Cuban patrol vessel fired at an unarmed U.S. S2F Tracker antisubmarine warfare plane flying over international waters. 10 By then there was no doubt that thousands of Red Army soldiers—“technicians,” said the Soviets—were pouring onto the island. On 9 September, a CIA U-2, flown by a Taiwanese pilot, was shot down over China by an SA-2 surface-to-air missile, providing policymakers with a reminder of how the Soviet SAMs in Cuba endangered U-2 overflights. 12 Consequently the spy plane missions over the island were halted. But, determined to get photographic proof to confirm reports that Soviet medium-range ballistic missiles (MRBMs) had arrived in Cuba, the National Security Council eased restrictions. And, because the Kennedy administration wanted a military officer at the controls, a CIA U-2 was piloted by Air Force Major Richard S. Heyser when the spy plane took off from edwards Air Force base in california near midnight on 13 October. Four and a half hours later, at 0731 on Sunday, 14 October, Heyser began his pass across a cloudless Cuba, 72,500 feet below. NPIc photo interpreters leaned for hours over light tables, peering at frames of the U-2 film through magnifying glasses and stereoscopic viewers. They were convinced they were looking at evidence that could prove the Soviet Union had delivered MRbMs to cuba. Once operational, the missiles would be capable of hitting U.S. cities with nuclear warheads. On the morning of Tuesday, 16 October, cIA officers presented blowups of the photos to Kennedy and briefed him about the interpreters’ findings. Secretary of Defense Robert McNamara introduced “some possible military alternatives,” especially the idea of “an air strike against these installations . . . plus the airfields plus the aircraft . . . plus all potential nuclear storage sites.” The word “nuclear” was uttered a dozen more times during the meeting. As the meeting was ending, President Kennedy went out of his way to give special recognition to the man who would be running the quarantine, Anderson. “Well, Admiral, it looks as though this is up to the Navy,” he said. That same day, the ASW carrier Essex (CVS-9) arrived at Guantanamo Naval Base, on Cuba’s southeastern tip, for six weeks of training. The oldest carrier in the Navy, she had been launched in 1942 and soon sailed into the Pacific, where she fought in several battles and survived a kamikaze attack. Overhauled at the Brooklyn Navy Yard, she had departed in September 1962 with up-to-date sonar and electronic countermeasure equipment. She carried two S2F Tracker squadrons and a helicopter squadron. Ward arrayed destroyers in a crescent shape that encompassed a swath of ocean 500 miles east of cuba, athwart the routes used by ships carrying Soviet cargoes. At the northern end of the crescent was the guided-missile cruiser Canberra (CAG-2) with two destroyers; at the southern end were the cruiser Newport News (CA-148) and two destroyers. The Essex and five destroyers backed up the quarantine line. Meanwhile Task Force 135, built around the carriers Independence (CVA-62) andEnterprise (CVAN-65) and including 32 ships, took up stations off cuba’s southeastern shore. 27 The possibility of an invasion was still high, and Guantanamo would be a likely battleground. On 22 October, Guantanamo’s Navy families were handed notices telling them that “Higher authority has directed theimmediate evacuation” of all dependents. The only women allowed to stay were Navy nurses, who might be needed in the darkening future. As the dependent families were sailing away, ships of the Amphibious Force Atlantic arrived to disembark Marines who had been scheduled to stage the Vieques Island exercise. Other Marines were airlifted in, joining a motley defense force that included Seabees from Naval Mobile construction battalions 4 and 7 and cuban volunteers from the civilian work force. By now, people beyond Gitmo knew there was some kind of crisis. but newspapers were not getting any reliable information from Kennedy or the tight-lipped members of excomm. Finally, as the Gitmo refugees packed their suitcases, the White House announced that at 1900 the president would make an important statement that would be carried on television and radio. Meanwhile McNamara requested risky low-level photography, and the Navy got the mission. 31 Six RF-8A cru saders from Light Photographic Squadron (VFP) 62—the “Fightin’ Photo”—took off from the Key West Naval Air Station. Dropping down to 400 feet, they sped across Cuba, then headed for the Naval Air Station Cecil Field, near Jacksonville, Florida. There, Navy photographer’s mates removed film from the Crusaders’ cameras for processing and delivery to the NPIC in Washington. As the end of October approached, Khrushchev and Kennedy were nearing agreement on terms for ending the crisis. But aerial photography showed that the Soviets were still constructing missile sites and assembling IL-28 bombers. Then a Soviet surface-toair missile shot down a U-2, killing its pilot, Air Force Major Rudolph Anderson Jr. Though President Kennedy decided not to retaliate, the NSA wanted proof that the Soviets had done it. One of the Oxford ’s tasks was to sweep the Cuban coast for signals showing that the Soviets had activated the surface-to-air missile systems protecting the ballistic-missile sites. On the day of Major Anderson’s death, the Oxford flashed a short message: Operators picked up signals from Spoon Rest, the NATO designation for Soviet early warning radar. A helicopter picked up the tape of the signal and sent it on its way to the NSA. Since the cold War ended, Soviet-era documents have illuminated the nuclear reality of 1962. We know now that 158 nuclear warheads had arrived in cuba by the time of the crisis. 39 We also know about a final voyage. The freighter Atkarsk, which had left Soviet waters in September 1960 bound for cuba and was tracked by the NSA, was back in cuba during the crisis. And, according to recent revelations, top Kremlin officials ordered the Atkarsk to carry the last tactical nuclear warheads out of cuba on 20 November 1962. 40 For the Soviets, the crisis was over. 1. U.S.S. Allen M. Sumner DD-692, Sea Stories—chapter 5, www.dd-692.com/ sea_stories_-_chapter_5.htm. 2. Combat aircraft number: Norman Polmar and John D. Gresham, DEFCON-2: Standing on the Brink of Nuclear War during the Cuban Missile Crisis (New York: John Wiley & Sons, 2006), 134. Ship count: ibid., 309–10. 3. “Indications of Soviet Arms Shipments to cuba,” Weekly Comint Economic Briefing , 5 October 1960. This is the first declassified document in the cuban Missile crisis Document Archive—1960, at www.nsa.gov/public_info/declass/cuban_missile_crisis/1960.shtml. 4. “U.S. Puts embargo On Goods To Cuba,” The New York Times , 20 October 1960. 6. Of several estimates of the invasion force, 1,400 is the number that appears frequently in accounts of the invasion. Seewww.jfklibrary.org/JFK/JFK-in-History/ The bay of Pigs.aspx. 7. “Premier is Grim,” The New York Times , 19 April 1961. 8. A Look back . . . Remembering the Cuban Missile crisis, www.cia.gov/newsinformation/featured-story-archive/2007-featured-story-a… . 9. Dino A. Brugioni, Eyeball to Eyeball: The Inside Story of the Cuban Missile Crisis (New York: Random House, 1991), 100–105. 10. The Naval Quarantine of Cuba, 1962, Naval Historical center. www.history . navy.mil/faqs/faq90-5.htm. 11. Brugioni, Eyeball to Eyeball , 105. 12. Polmar and Gresham, DEFCON-2 , 80. 13. Brugioni, Eyeball to Eyeball , 190, 193. 14. Sheldon M. Stern, The Week the World Stood Still: Inside the Secret Cuban Missile Crisis (Stanford, cA: Stanford University Press, 2005), 38. Stern was a historian at the John F. Kennedy Presidential Library from 1977 through 1999. The library began declassifying and releasing the secret Kennedy tapes in 1973. They would include excomm meetings, with some colloquies redacted. 15. Kennedy Library, President’s Office Files, Presidential Recordings, Transcripts. www.jfklibrary.org/ JFK/JFK-in-History/cuban-Missile-crisis.aspx. 16. Curtis A. Utz, Cordon of Steel: The U.S. Navy and the Cuban Missile Crisis (Naval Historical center, Washington, 1993), 14. 17. Polmar and Gresham, DEFCON-2 , 49. 18. Chief of Naval Operations, Report on the Naval Quarantine of Cuba , Operational Archives branch, Post 46 command File, box 10, Washington, Dc., published on the Naval Historical center webpage, www.history.navy.mil/faqs/faq90-5.htm (hereafter cited as CNO Report). 19. Ray S. Cline, “A CIA Reminiscence,” Washington Quarterly , Autumn 1982, 91. At the time of the cuban Missile crisis, cline was the cIA’s deputy director for intelligence. 20. CNO Report, 19 October 1962. 21. Stern, The Week The World Stood Still , 75. 22. Brugioni, Eyeball to Eyeball , 335. 23. Stern, The Week the World Stood Still , 75. 24. Ibid., 76. 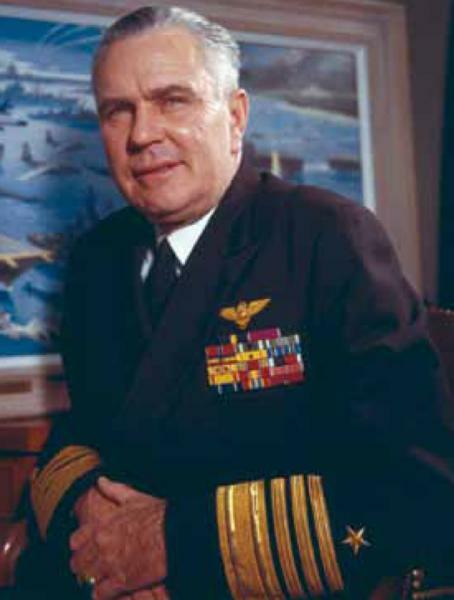 The dialogue between President Kennedy and Admiral Anderson has been quoted by many sources without the specific time and place provided by Stern, who is the leading authority for the White House tapes’ content. 25. Utz, Cordon of Steel , 16. 27. Polmar and Gresham, DEFCON-2 , Appendix c, “U.S. Naval Forces in the caribbean,” 309. Task force ship counts include replenishing ships. Positioning of the two task forces is shown on a Flag Plot chart, 24 October 1962, 2230Q, from U.S. Navy Operational Archives, Naval Historical center, Washington Navy Yard, cuba History Files. Author’s collection. 28. An evacuation notice is posted at the Guantanamo Public Memory Project: http://gitmomemory.org/blog/blog/tag/janet-miller/; Utz, Cordon of Steel , 27, reports the evacuation. 29. “President Grave; Asserts Russians Lied . . . ,” The New York Times , 23 October 1962. 30. Utz, Cordon of Steel , 16; Senate Resolution 479: A resolution commemorating the dedication of the Strategic Air command Memorial during the 20th anniversary of its stand-down, 5 June 2012, www.govtrack.us/congress/bills/112/sres479/text. 31. Record of Action of the Fourth Meeting of the executive committee of the National Security council Washington, 25 October 1962, http://microsites . jfklibrary.org/cmc/oct25/doc2.html. 32. Utz, Cordon of Steel , 34. Accounts vary about LeMay’s exact words, but not the sentiment. 33. Brugioni, Eyeball to Eyeball , 375, 554. 34. “The Cuban Missile crisis. How Well Did the Joint chiefs of Staff Work?” Walter S. Poole, chief, Joint Staff History branch in the Joint History Office, www.history.navy.mil/colloquia/cch7b.html . 35. James Bamford, Body of Secrets (New York: Doubleday 2001), 94. 36. When the quarantine began, NSA “listened to radio messages to and from Soviet vessels on their way to cuba” and on 23 October, concluded, “The ships were stopped dead in the water, outside the ring of American naval vessels waiting for them.” Thomas R. Johnson and David A. Hatch, NSA and the Cuban Missile Crisis (center for cryptologic History, Fort George G. Meade, MD, 1998), 10. 37. “Forty Years Ago: The Cuban Missile Crisis,” Prologue , vol. 34, no. 3 (Fall 2002),www.archives.gov/publications/prologue/2002/fall/cuban-missiles.html . 38. McGeorge Bundy, Danger and Survival: Choices About the Bomb in the First Fifty Years (New York: Random House, 1988), 434. 39. Anatoli I. Gribkov, William Y. Smith, and Alfred Friendly, Operation Anadyr: U.S. and Soviet Generals Recount the Cuban Missile Crisis (chicago: edition Q, 1993). 40. Svetlana Savaranskaya, “Tactical Nuclear Weapons in cuba: New evidence.” Cold War International History Project Bulletin , issue 14/15 (Winter 2003/ Spring 2004), 387.